A year after his victory Colin Lloyd comes back as the number one in the world and reaches the final again. This time, however, he faces Phil Taylor in the final and The Power won’t lose in two consecutive years. Taylor clearly shows who is the best and wins the final 7-1. John Magowan from Northern Ireland has a fantastic year, he gets to the quarterfinals after victories over Alan Caves and Peter Manley. He himself and his family had not expected to get to the quarterfinals because on that day they had planned the marriage of his son. Magowan is flown by helicopter back and forth to the wedding and is back in time to play. He loses the quarterfinal to Dennis Smith. 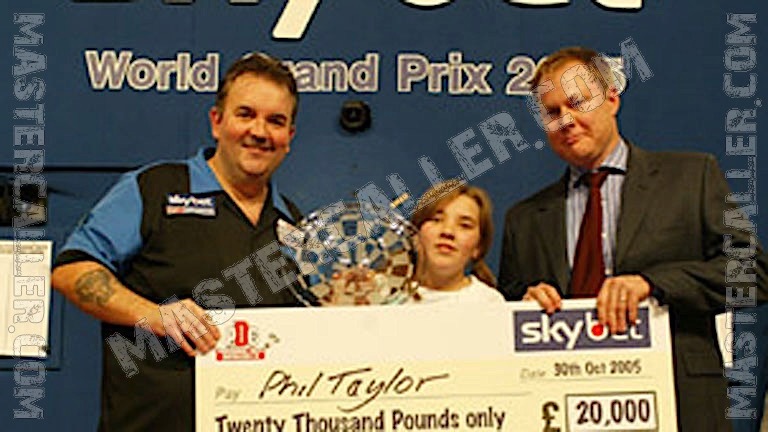 In 2005 we first see the future winner James Wade at the World Grand Prix. He loses at his debut in the first round to Irishman Keith Rooney. Roland Scholten again is the only Dutch competitor, but 2005 is not his year. He lost in the first round to good-old Dennis Priestley. The former world champion will get to the semi-finals that year. He loses it to Colin Lloyd 4-6. Taylor, this year once again is in a different class, The Power loses only one set in the entire tournament, an absolute record.